Copying music from a CD to a home computer could be made legal under new proposals from the UK government. 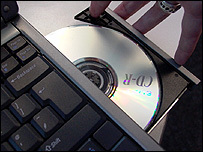 Millions of people already "rip" discs to their computers and move the files to MP3 players, although the process is technically against copyright law. Intellectual property minister Lord Triesman said the law should be changed so it "keeps up with the times". Music industry bodies gave a cautious welcome to the proposals, which are up for public consultation until 8 April. The changes would apply only to people copying music for personal use - meaning multiple copying and internet file-sharing would still be banned. Owners would not be allowed to sell or give away their original discs once they had made a copy. "To allow consumers to copy works and then pass on the original could result in a loss of sales," the proposals warn. UK music industry body the BPI said it supported the move to clarify the law for consumers, but warned that any changes should not damage the rights of record companies. The Association of Independent Music (Aim) said the proposals did not go far enough - pointing out that CDs could become obsolete in the next decade. It said that, once CDs are replaced, the law could be misused to "open the floodgates to unstoppable copying", adding that it would like to see copyright holders compensated when music was copied. Lord Triesman said the proposed changes would explore "where the boundaries lie between strong protection for right holders and appropriate levels of access for users". The proposals also suggest schools and libraries should be given greater flexibility in how they use copyrighted material like CDs and DVDs, and suggests parodies of songs and films could be made exempt from copyright law. The consultation follows the Gowers Review of Intellectual Property, which recommended that aspects of the intellectual property system should be reformed.